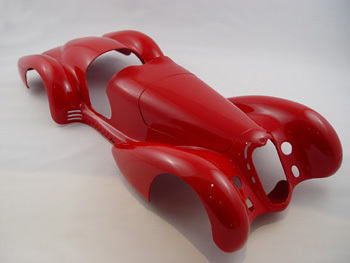 Here's the one I've been waiting for -- an 8C 2900 Mille Miglia body for the Pocher Alfa chassis, from modelmotorcars .com. coming in January. Look great, who did make it. It's direct from modelmotorcars .com, who usually makes aftermarket parts for Pocher kits. Was this body ever produced? ....but to fit the Pocher kit? I was talking about the model body. It appears to have been dropped from any further planning. Would anybody be interested in a metal body? I'm thinking about getting one made from a CNC design. If that works, it would be possible to have more made on demand. Perhaps part of the explanation for why this body was never produced is that the 8C 2900 had a very different engine and chassis than the 8C 2300. The 8C 2900 chassis had four wheel independent suspension, a transaxle, hydraulic dampers, and hydraulic brakes. A reasonably accurate 8C 2900 could not be built without scratch building an 8C 2900 engine and chassis. Last edited by David100; 04-07-19 at 03:47 PM. This is a such outstanding beautifull car, that I think there are many guys that would have a model. I have some questions: what scale do you like to made? I think about the need of rims and tires...And wy in metal, and not in resin ? Do you have the data ready? Why not a curbside model? I am very interested!